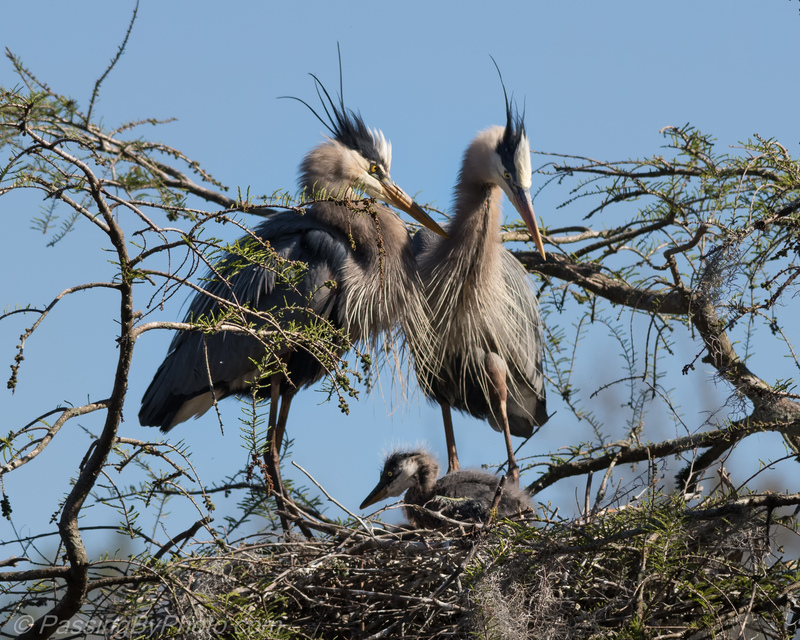 I’ve observed Great Blue Heron parents stand in poses over the nest and chicks that must serve some function. Are they trying to shield the small chicks that have settled down out of sight from the wind or maybe concentrate the warmth of the sun? Is it just comfortable after laying on the nest for hours? 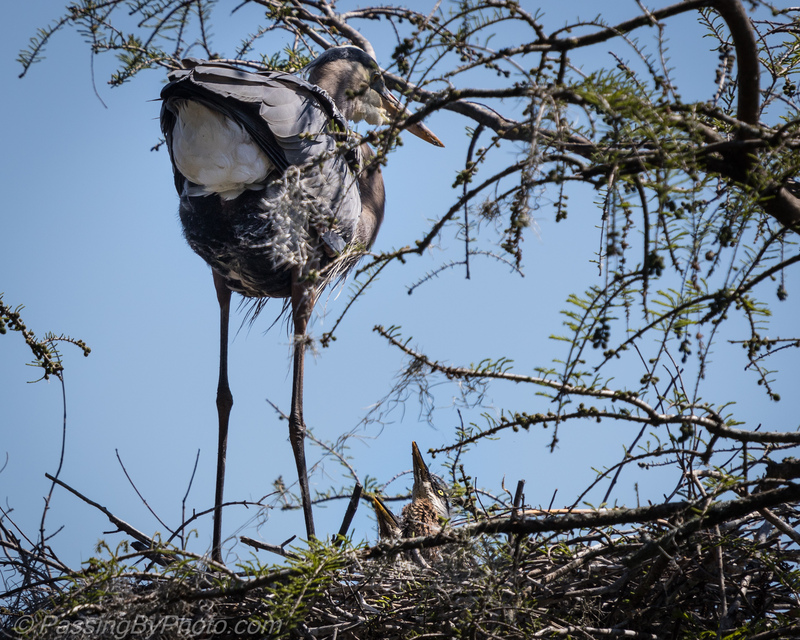 At this same nest eleven days later, it wasn’t windy and the chicks were sitting up. 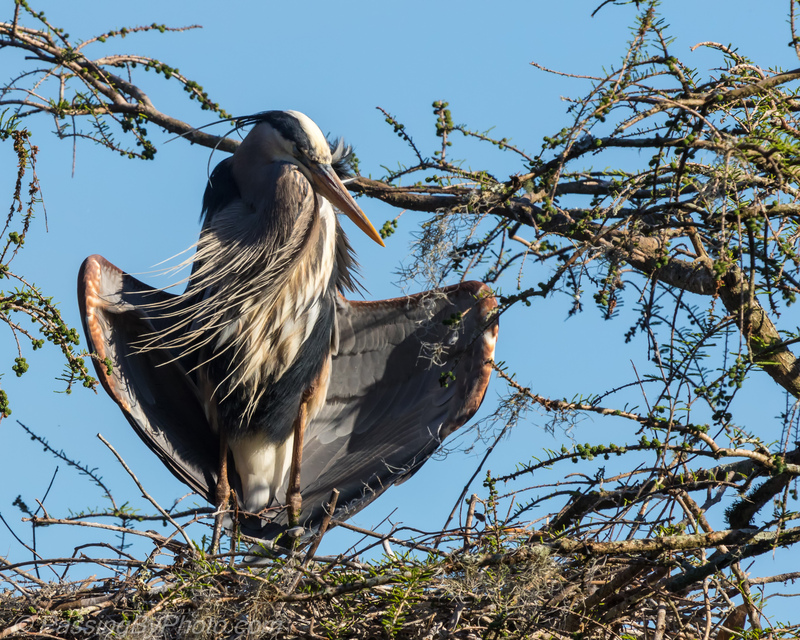 At first I thought the adult was just stretching, but then the wings went into this same purposeful sail-like arrangement. 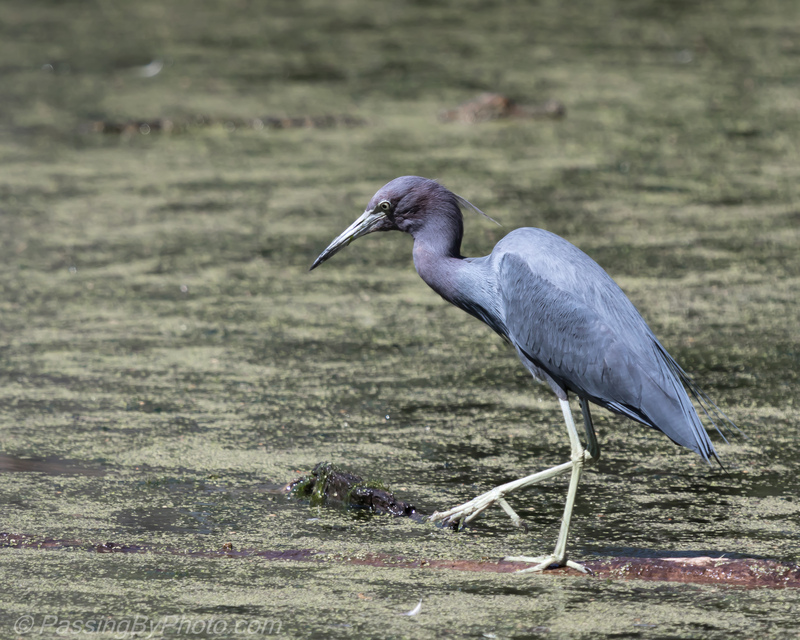 Sometimes it is just a stretch…wing out, wing down, leg up, and hold, 2, 3, 4. 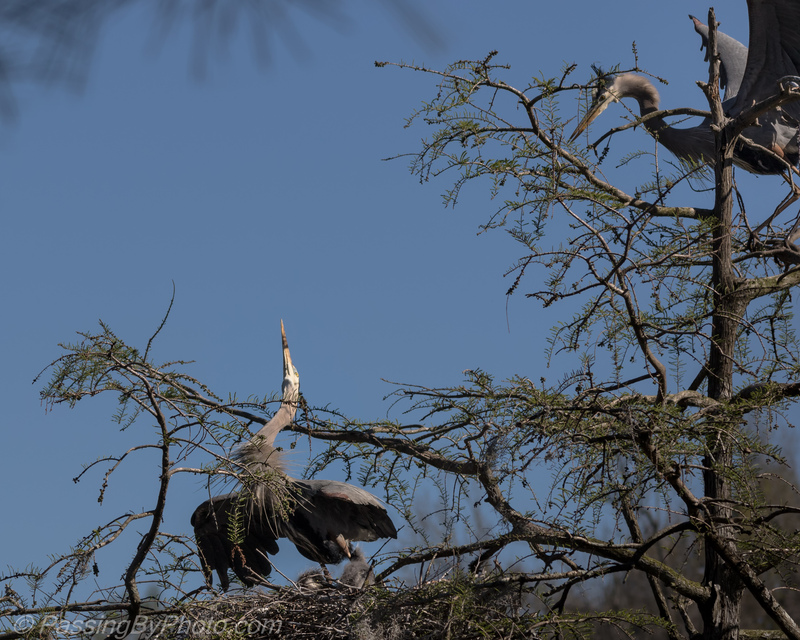 I witnessed another exchange of the adult Great Blue Herons on the nest yesterday. 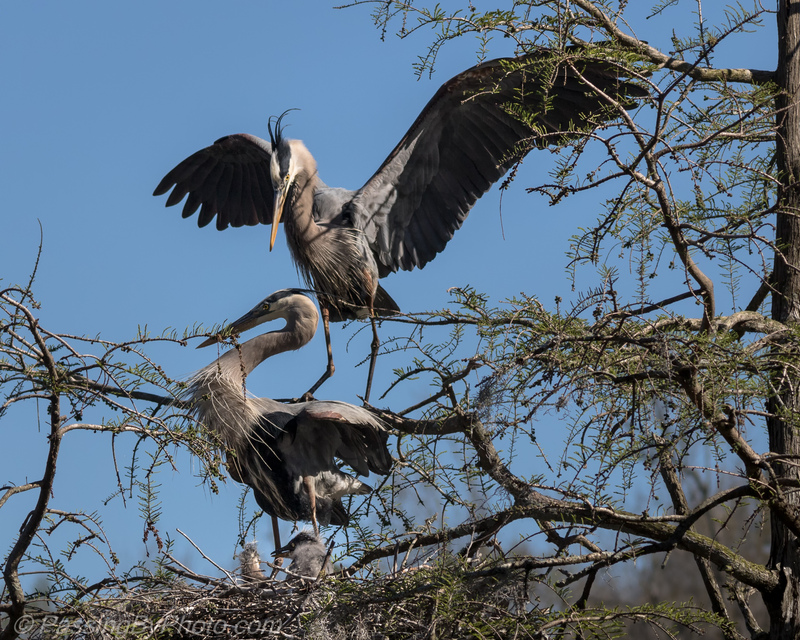 Last week I posted photos of another pair doing this where the exchange was quick, as if the bird on the nest couldn’t wait to have a turn away–perhaps in need of a meal. 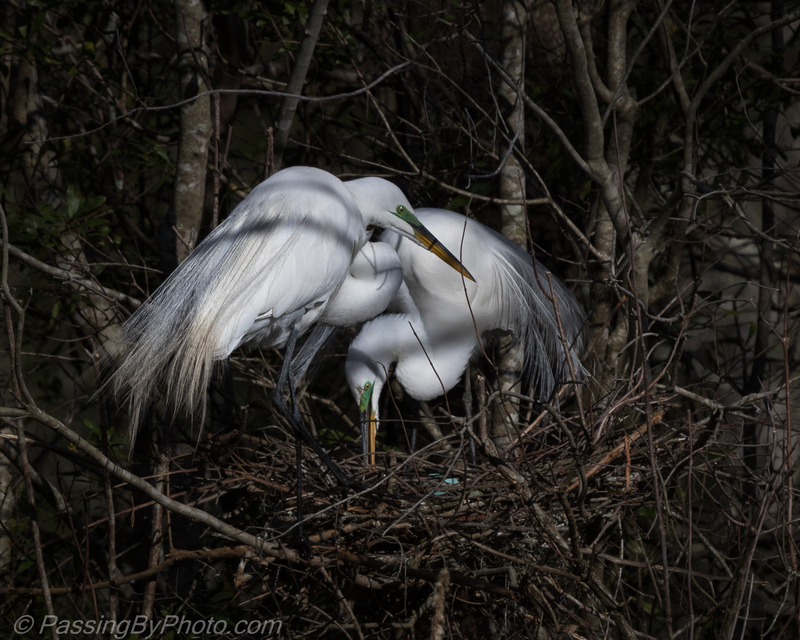 This time the adults started with a mating-type dance then spent more time interacting. 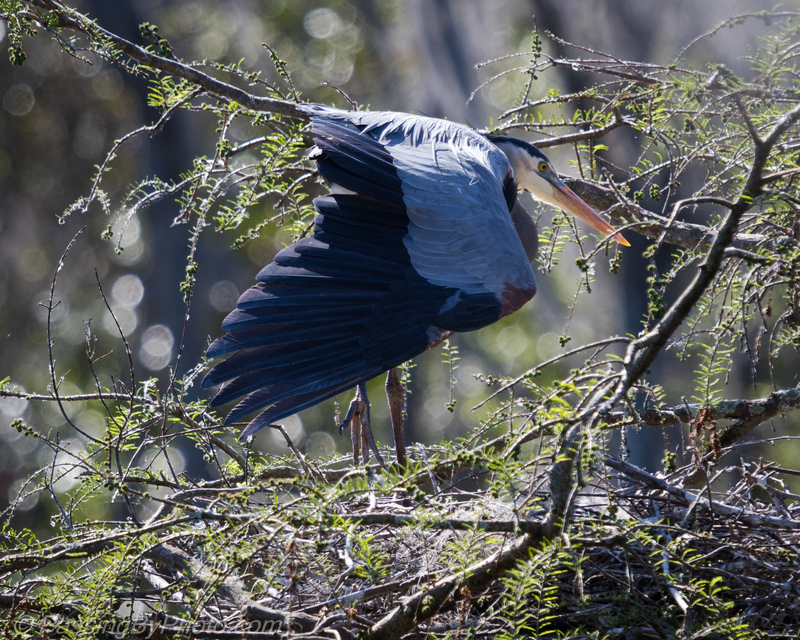 The nest set up is a little different and the approach of the incoming Heron required more finesse to get into the nest. 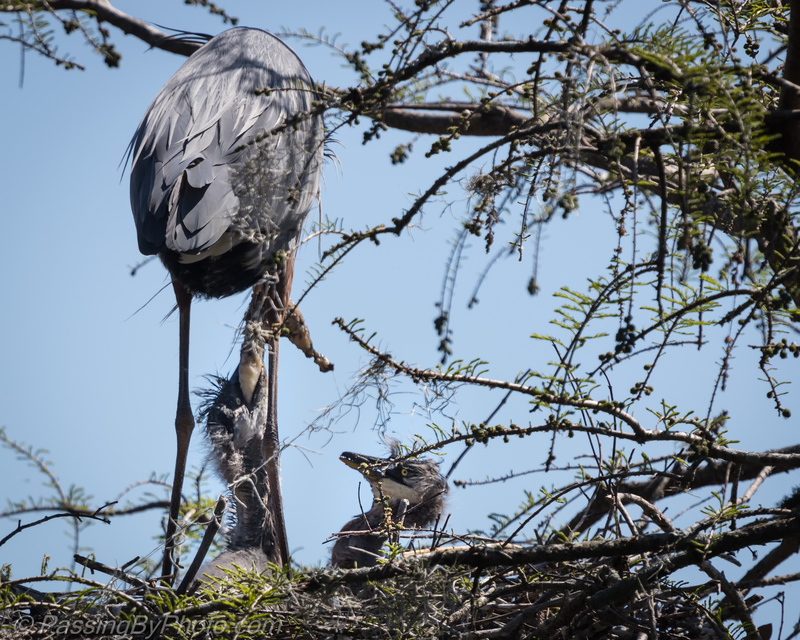 After settling in the pair took inventory of the chicks and poked at each other with their beaks. 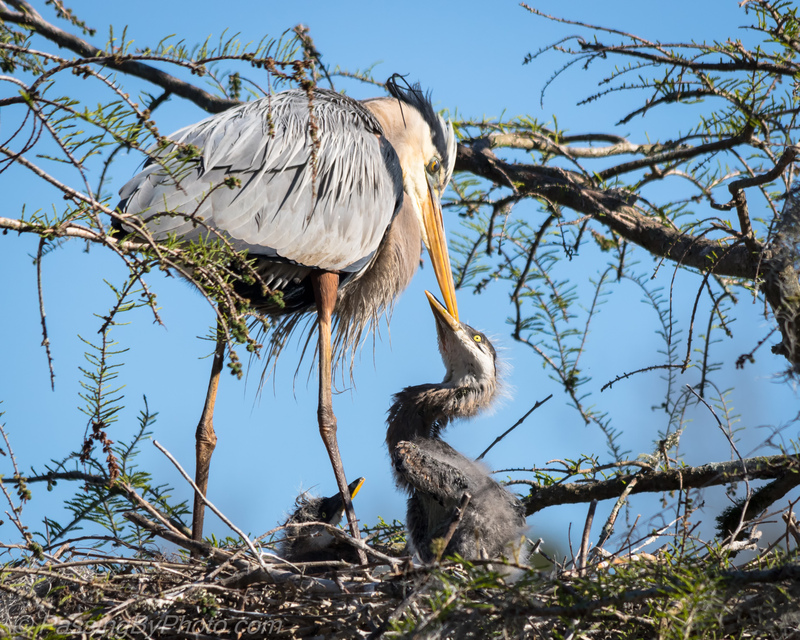 After the first adult flew off the recently arrived adult interacted with the chicks. 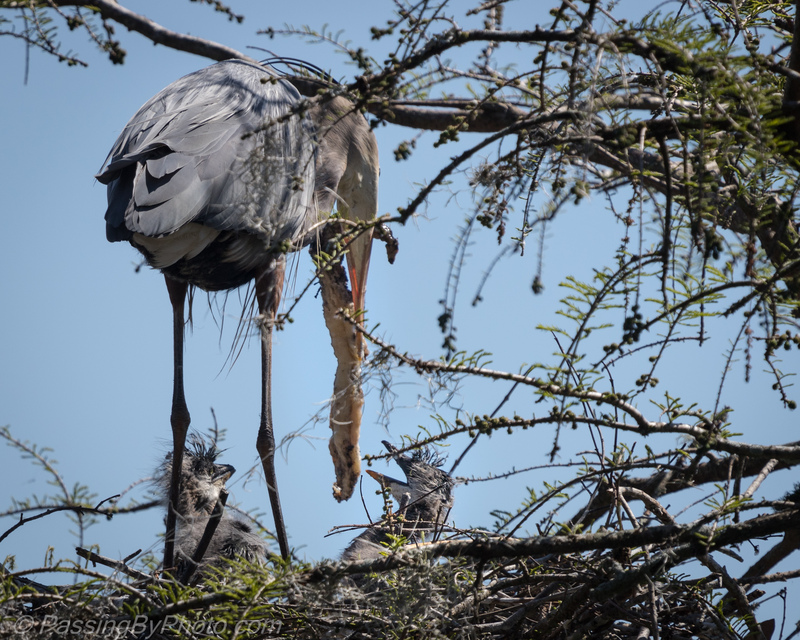 The one on the right, likely a day or two older, has grown so that he now displays the familiar heron flexo-neck as he stretches up to chew on the adult’s beak. These chicks are around 14 days old. 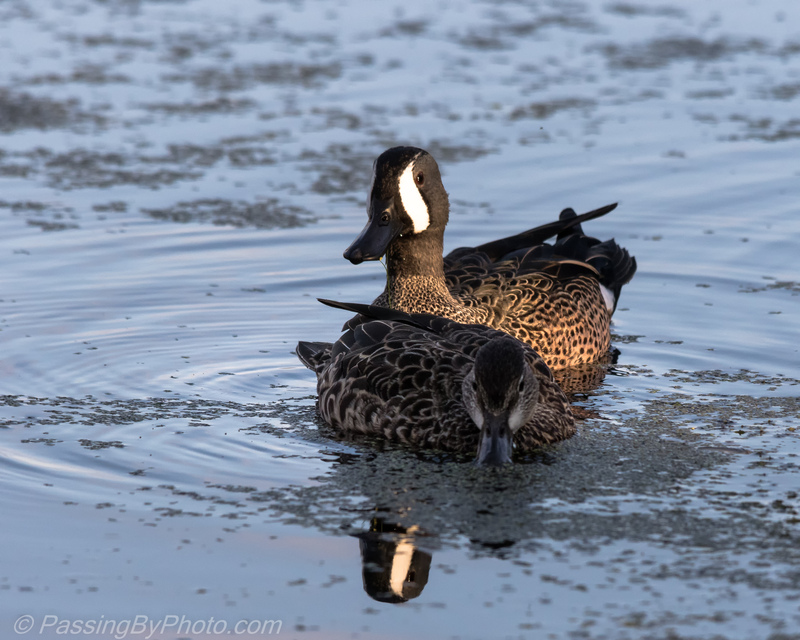 The females of most species of ducks are drab in comparison to their male counterparts, at least in breeding season. This female Blue-winged Teal blends right into her swimming partner, overshadowed by his brilliant head that also makes a nice reflection. 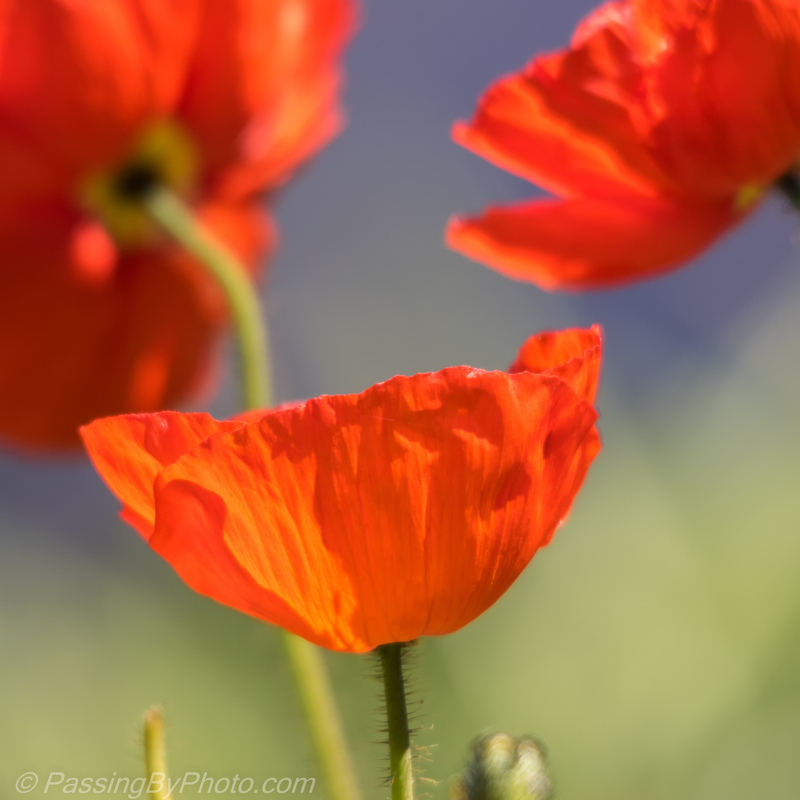 We had just had a hard late season frost so I was quite surprised to see these brilliant poppies in full bloom along my path. 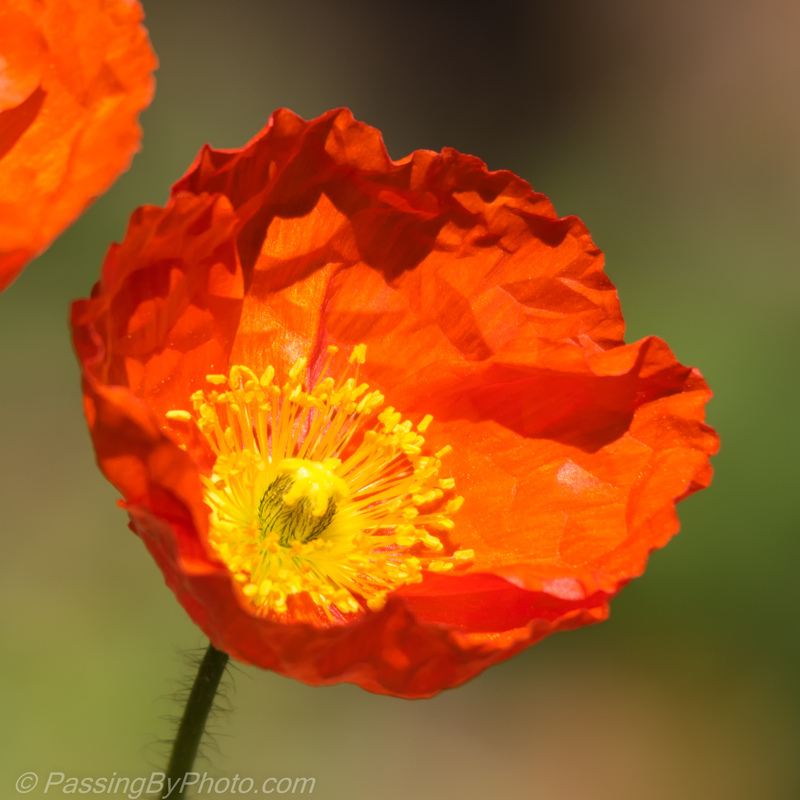 The blooms were dancing in a light breeze, the full sun highlighting the colors. 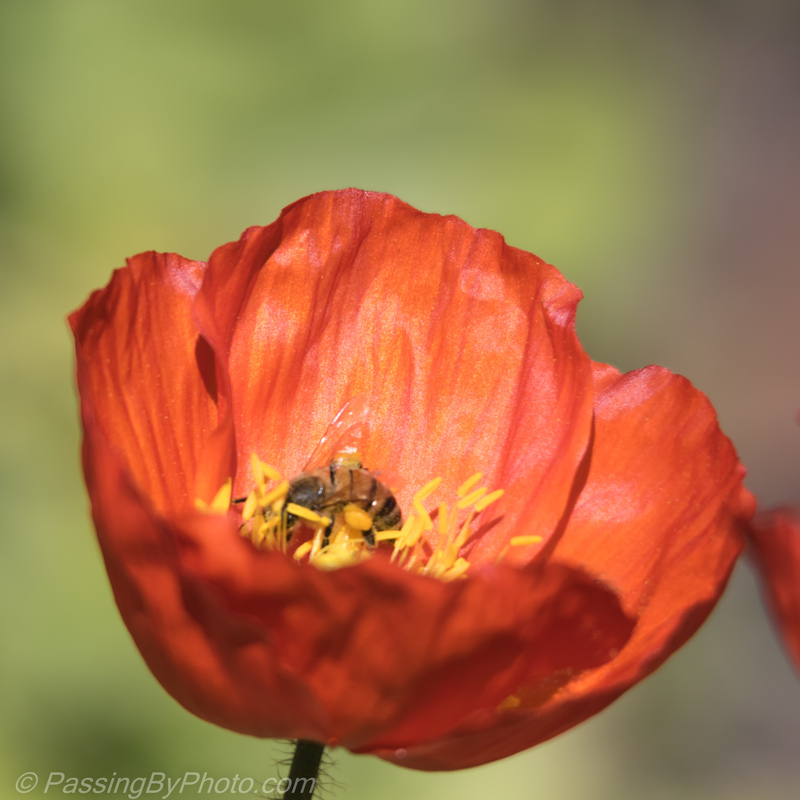 A bee filled his pollen sacks with seemingly little effort, gliding around in the flower cup. It was worth the stop and delay in getting to my destination. 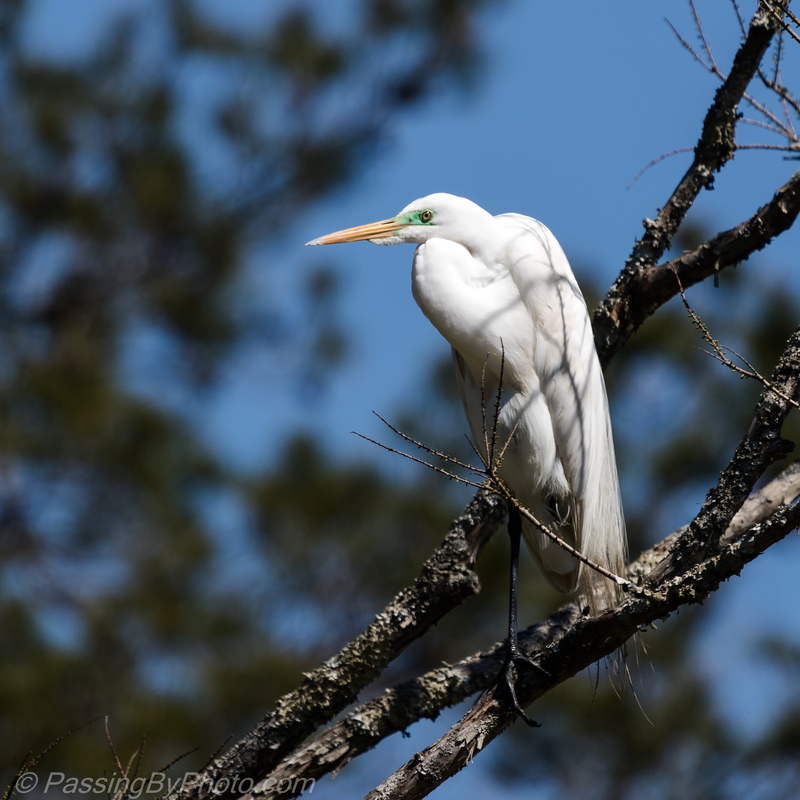 Ignoring the flurry of mating and nesting activity in the pond behind him this Great Egret enjoyed the afternoon sun on his own. 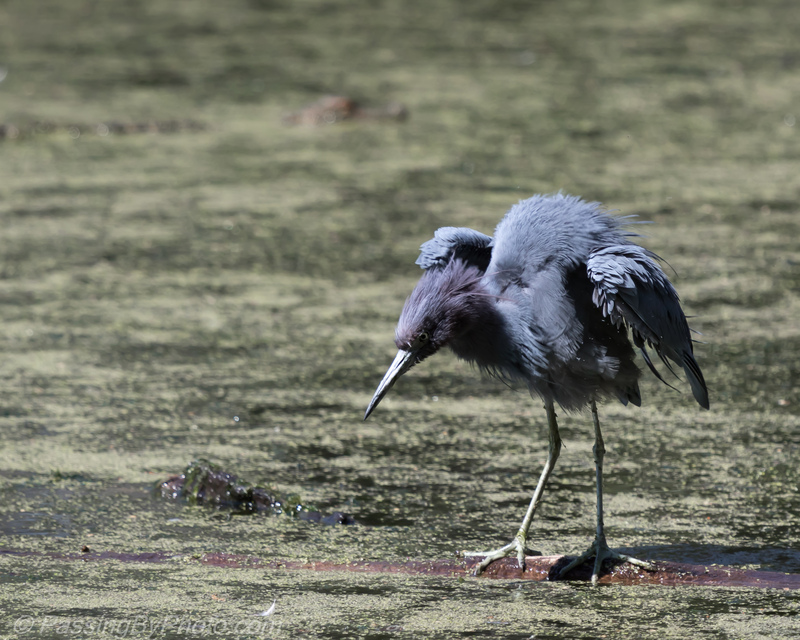 His long feather plumes of breeding season are neatly tucked in but he can’t hide that neon green face patch. Lichen and moss add a little interest to early spring photographs before the trees have leafed out. Northern Cardinals have a wide range across much of the United States east of the Rocky Mountains and down into Mexico and northern Central America. 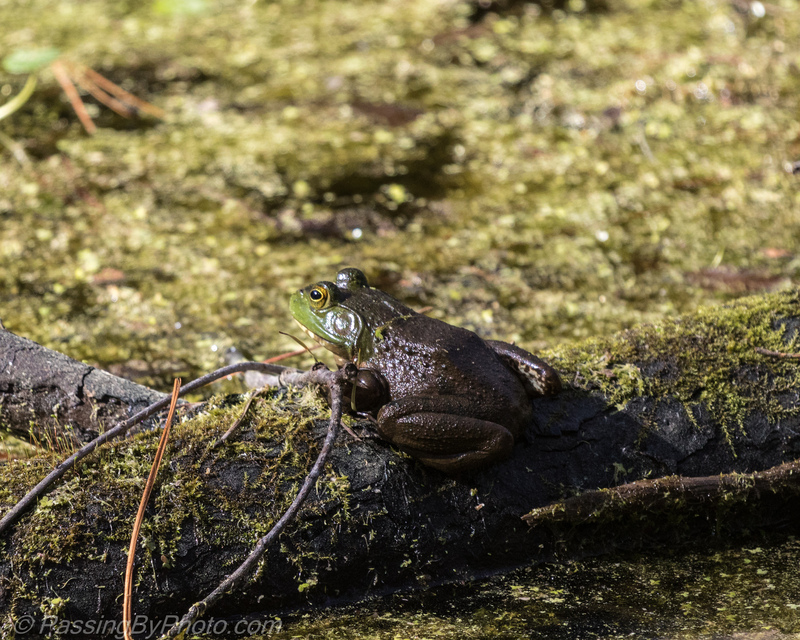 I frequently see them but rarely get a good shot. Northern Cardinal, singing his heart out, Click on photo for larger view. 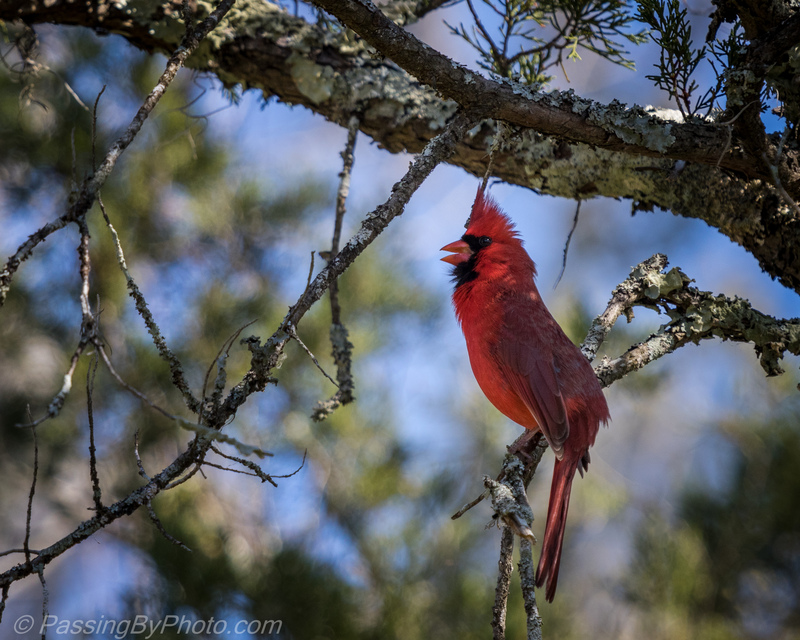 This male Northern Cardinal was singing loud and clear in a tree above me but I just couldn’t spot him. I expected him to fly away as two people approached from the opposite direction. They could hear, and see, him, and seeing my dilemma kindly pointed him out. 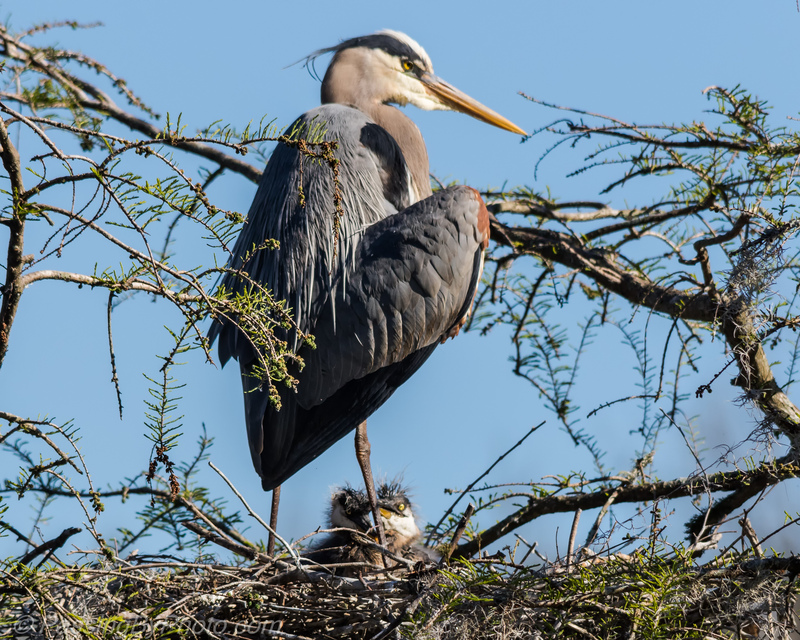 Peeking up over the top of the nest the Great Blue Heron chicks are ready for a snack. Fortunately, mom had something ready. 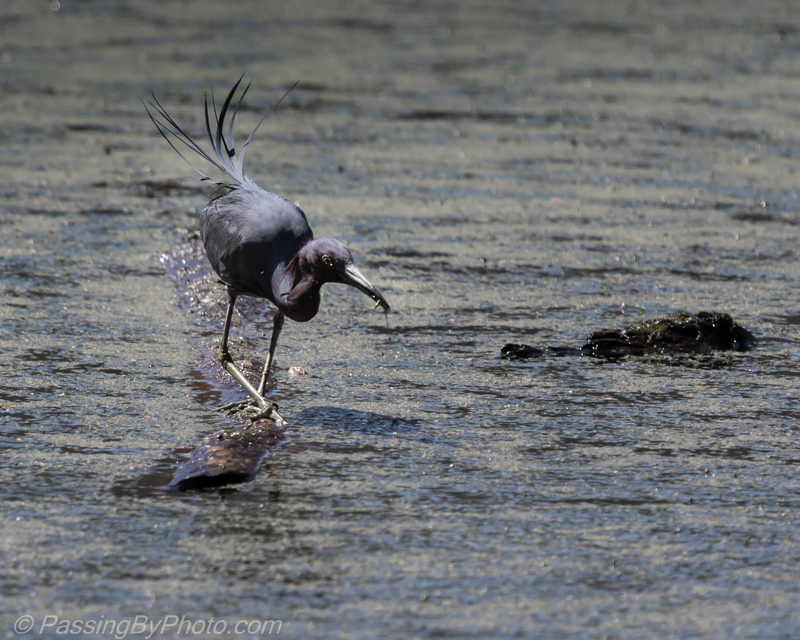 She dangles the fish while the young gnaw on it. 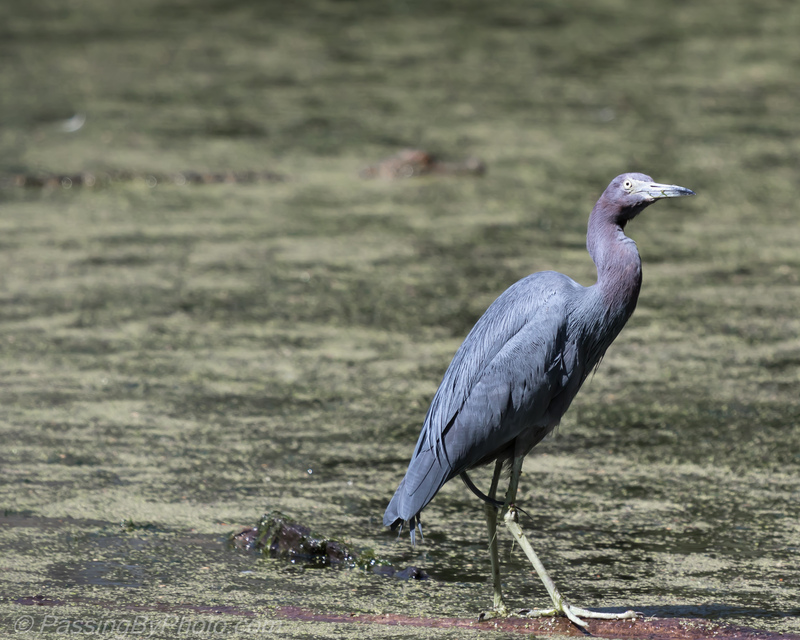 With those tiny beaks and throats I don’t know how they manage to get anything. Lefty here gave it a good try. The chicks aren’t very strong yet and are prone to falling over, another impediment to getting a decent meal. 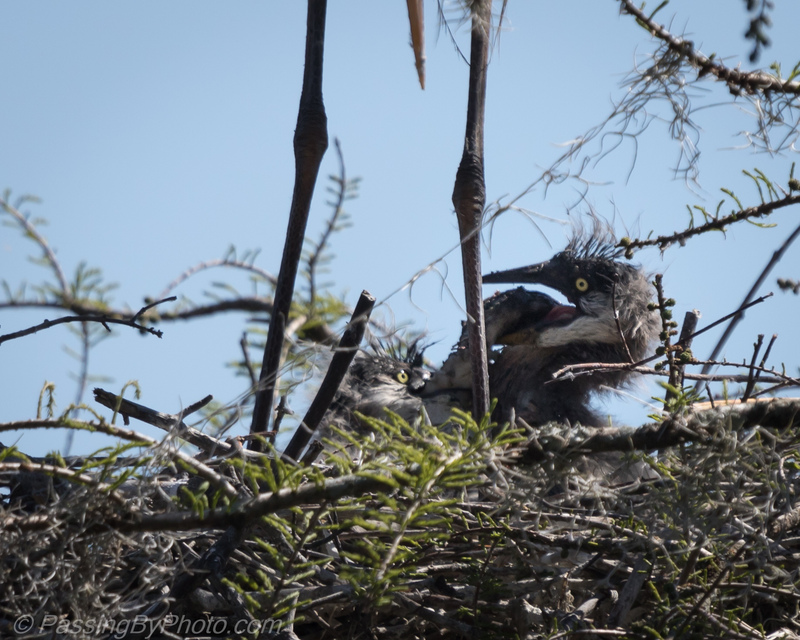 The adult poked the food around in the nest, maybe tearing off pieces as all of a sudden the chicks had a piece only as big as their heads that they shared.